Roof Insurance Repairs Georgia: Do You Have Hail Damage? At first, the title of this article might seem silly: “what is hail?” Every person reading this blog has experienced hail at one time or another, and we know hail when we see it. 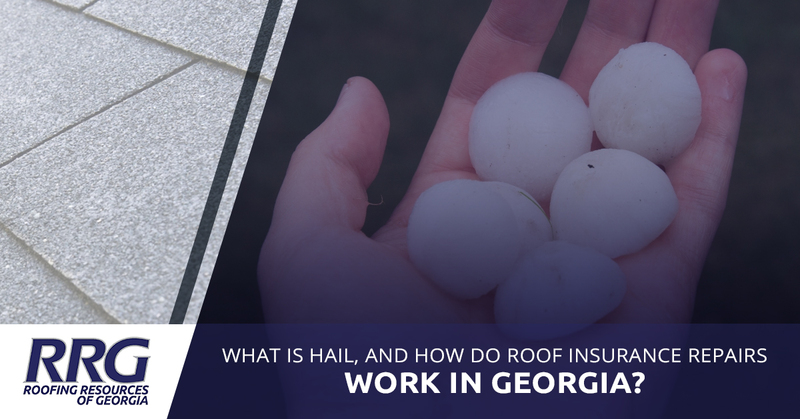 But many people might not know what constitutes hail damage, and how roof insurance repairs work in Georgia. That’s what we’re here to talk about today. There’s that simple question again! Hail is a form of solid precipitation that sometimes occurs in cumulonimbus clouds during thunderstorms (even though hail can blow in from a storm up to two miles away). The basic theory behind hail formation goes like this: a water droplet is blown upwards in a cloud to such heights that the temperature freezes it. It falls down through the cloud, and if it is blown back up again, it catches more water and a layer of ice freezes over it. This keeps happening until the weight of the hailstone becomes too heavy for the winds to keep it aloft. It then falls to the ground, and hopefully doesn’t do any hail damage. Hail is different from sleet, as sleet tends to fall when it is cold. Sleet is also solid precipitation, but the ice pellets are smaller and more plentiful than hail. Cold weather actually prevents hail from forming, which is why it’s so common in summer. While we’re on the subject, let’s bring up graupel, because most people don’t know about graupel. Graupel is softer than hail and occurs when the weather is cold and water droplet freeze on snowflakes. It looks a lot like shaved ice you might get at a fair. Neither graupel nor sleet presents any damage danger to your home. Hail does about $10 billion (that’s billion with a B) in damages in the United States every year, and the costs continue to rise. In fact, in 2017 there were two hail storms that did more than $2 billion each in the US, one in Minneapolis and one in Denver. Part of the reason for the increase in damage is urban sprawl, giving hail more targets. Home sizes have also doubled in the last 40 years, giving the hail bigger targets. And while vinyl siding might be nice and easy to install, it’s also very vulnerable to hail damage. What Is Hail Damage? What Gets Damaged? Now that you know what hail is, you might wonder what’s going to get damaged when it falls. While crop damage and automobile damage is a huge part of the havoc hail wreaks, today we’re going to talk about the most common ways that it damages buildings. When people think of parts of a house being damaged by hail, their first thought is usually the roof. When hail reaches a certain size — say the size of a softball all the way up to a soccer ball! — each hailstone is carrying a lot of energy with it by the time it falls from the clouds and hits a roof. The type of roof you have and its age can make a big difference, but once hailstones reach a certain size there aren’t many materials that can stand up to it. Hail damage on the roof itself can be difficult for the average person to identify. For an asphalt roof, hail damage can look like general wear to most people, but to a roofer the signs are obvious. If you see that many other people in your neighborhood are getting new roofs, you might want to call a roofing contractor to see if you also need roof replacement. We just mentioned that roof damage can be difficult for most people to identify, but seeing vent and flashing damage is a bit easier. That’s because the damage in metal can be very obvious because of the way the light hits it. Heating vents, bathroom vents, attic fans, flashing, radon vents, and many other types of metal caps on roofs can easily show damage. That’s when it’s time to call a roofer. Siding is the most common type of house covering in the United States today. And while it holds up very well to most of the elements, it’s Achilles heel is hail. Hail can shred siding, especially if the siding is old and its molecules have been broken down by years of UV radiation. Because hail can blow in from distant thunderstorms, it sometimes comes in at an angle that can smash through windows. And even if the hailstone itself doesn’t end up in the house, the crack it causes in the window can cause the inert gas between the window panes to seep out, compromising the building’s thermal envelope. Our roofing company can help you find the right contractor to replace a broken window due to hail damage. How Do Roofing Insurance Repairs Work? If you believe you might have hail damages, the process of getting roof repair or roof replacement isn’t that difficult. Better yet, your insurance company might pay for the entire thing. First of all, give our roofing company a call at 678-517-4211. We’ll give you a free inspection and let you know if you should contact your insurance company. If we believe that you do have a valid claim to file, we’ll help you contact your insurance company and start a claim. They’ll send out an adjuster to find out if you do, indeed, have reason to file a claim. We’ll even be there when the adjuster arrives to show him what we’ve seen. If your claim is approved, we’ll work with your insurance company to make sure that they are providing enough money to cover the roof in accordance with state and local codes. Once payment is squared away with them, we’ll get to work on your roof repairs or replacement! To get an even more detailed description of what can expect with roof insurance claims, click here. When it comes to hail damage on cars, the damage is purely cosmetic unless a window is busted out. But when it comes to hail damage on a roof, hail damage can lead to some pretty bad problems. In the case of asphalt shingles, once they start to lose their granules it’s a fast slide to shingles that fail completely. This can lead to exposed areas of your roof and water that gets under the shingles and into your home. If you believe you’ve suffered hail damage to your Georgia home or business, we want to help. Contact the best roofers around today!